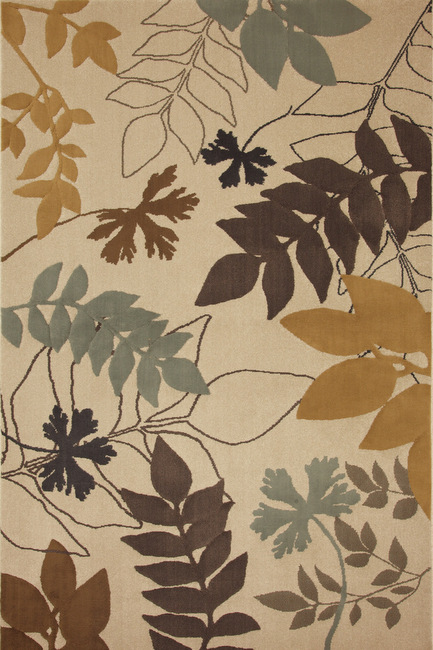 I am definitely drawn to leafy rugs, and I really liked the muted colors. Our intention was to put the rug in my craft room. Even though I have a desk in there, I’m quite frequently crafting on the floor and we thought it might make sense to put a rug in the center to protect the carpet. So, the day my pretty new rug arrived, I rushed in the house and unwrapped it and put it in my Craft room and it did not look good! It made all the furniture look way too white. Since Bob wasn’t home, I decided I’d work on an alternate location for the rug, so I put it in the breakfast room. I really liked the colors. The breakfast room is very open and the gold tones worked well with the walls and furniture. Plus, I thought it was nice to carry in the blues from the living room. A good blogger would have a picture to show you, but alas, I did not take any pictures!! Because, the rug didn’t stay there. We left it in the breakfast room for several days, but Bob didn’t like it there. So, we tried it in the craft room again, and it stayed there for a few days. I knew I didn’t like it, but Bob wasn’t sure. I had resigned myself to painting my craft room furniture to go with the rug…hehe…I was actually excited about this potential, but again it was not meant to be. The next rug location was the foyer. This was a quick decision…no way! The rug was too big for the space and made it feel too busy. So now what, we took the rug to the basement. We had wanted a rug for under the table and hadn’t really thought about that location until it felt like we were out of options. Fortunately, it worked! Hooray!! We finally had a location for the rug. 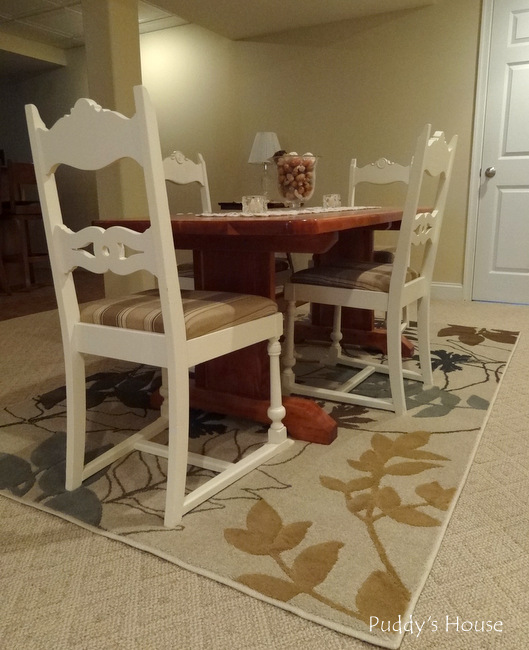 The rug fit the space well and we liked the extra color it added. Since it is our basement, there isn’t much natural light and it is challenging to get good pictures of the rug. We’ve had rug for several weeks now and really do like it. The area needed to be defined and the rug does just that and looks pretty too. It also gave me reason to share this area of our basement again. The only other thing that is about as challenging as picking out rugs for Bob and I is agreeing on artwork. We added the painting in this picture last Fall. It was one we picked up on vacation last year and Bob asked where we’d put it and I made up some location just because we actually agreed on artwork and I wanted it…I’d figure out where to put it later (sounds kind of like our rug). So, this is where our vacation artwork ended up. Slowly but surely, this area is getting decorated. So enough rambling about my rug and onto the exciting part! Mohawk Home is giving away a rug up to size 5×8 and $150 to one of my lucky readers!! 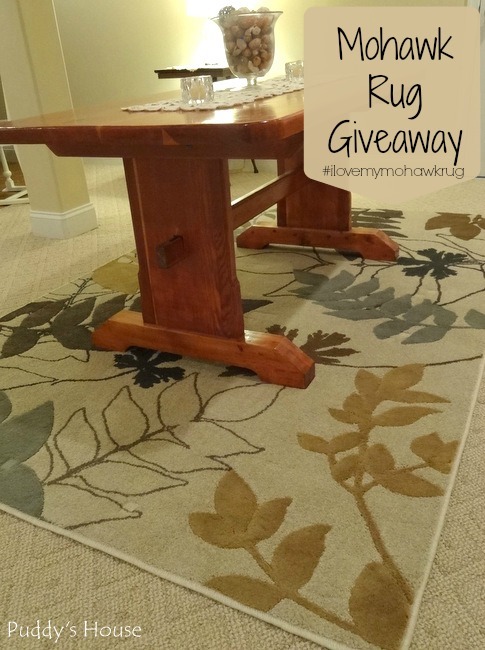 YES, you could win a pretty new rug too! Mohawk Home has a great selection of rugs. You can find them on their blog, Facebook, Twitter, Hometalk, YouTube, Pinterest, Google+, and Houzz.com. Disclosure: This giveaway will close on July 3, 2014 at 11:59 pm ET. The winner will be chosen by rafflecopter.com and I will notify you by email on July 4, 2014. You will need to respond within 48 hours to claim your prize or another winner will be chosen. I’d love to win a rug to help with the makeover of our living room. The rug looks great. A rug that size might be nice under my kitchen table. I would love a rug for my master! I am getting ready to pull up the carpeting in the guest room, and a new rug would be perfect! I am trying to complete my guest bedroom and a new rug would be great! Would love a rug for our living room. Yay! great giveaway! 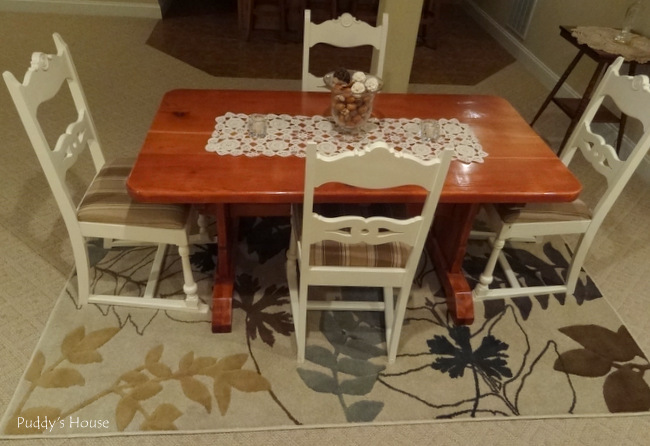 I would love new rug under my kitchen table! The rug looks great. I’m currently redoing my playroom and would love a new rug. Great choice!! I’d love a new rug for my upstairs family room! fun giveaway! I’d love to win a Mohawk Rug 🙂 My floors are all bare! Love the chairs in your dining set! Love the colors in the rug, it really does make a difference in the basement. I need a rug for the entryway, dining room, play room, living room, outside, so pretty much everywhere 🙂 I’ve heard great things about the Mohawk rugs! Thanks Sara! Those chairs are one of my very early DIY projects, they used to be baby blue with hideous old fabric. 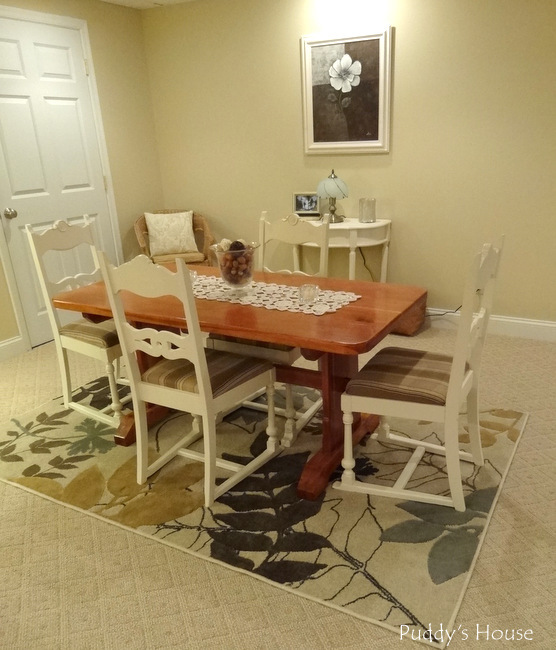 Yes the rug really helped our basement dining area. The space is so big and open it needed that kind of definition. I would put a new rug in my master bedroom. Thank you for the wonderful giveaway. I need a new rug for my living room!! I would put this in our spare bedroom which will hopefully be a nursery in near future! I would put the rug in my children’s playroom. I would put the new rug in our foyer/dining room open area. I would like a new rug for my living room. I would put it in our foyer. I need a rug in our dining room. I would love it for my new living room! I’d love a new rug for our sunroom! I am always looking for new rugs for my home! Yours is a beautiful choice! What a fun giveaway! We need a rug for our entry! I could really use a rug in my living room. Wood floors + too much brown. I would use the rug in our living room! We need one in the kitchen! I would put the rug in our dining room. We really need a new rug in our kitchen. I love the one you chose! My dining room has been begging for a rug since we moved in. Six years ago. I’d love a new rug for our study room. We put down hardwood last year and it really needs a rug to warm up the space. Thanks for the chance. I would love to win a new rug to help my husband and I finish our guest bedroom. That is the last thing we need and the room will be complete! I would love a new rug for my living room. I would put in my living room!